Jet2 flight 389 departed from Leeds/Bradford (LBA) at 08:05 UTC. The captain was Pilot Flying (PF). 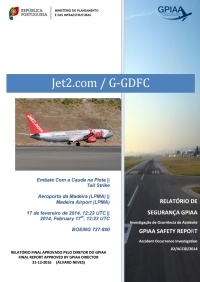 The en route part and descent towards Funchal (FNC), Madeira, were uneventful. There was a partially cloudy sky at Funchal with good visibility, surface wind was strong from 330° at 14 kts gusting to 24 kts, with variations in direction between 220° and 020°. Temperature was 15°C. The commander reported that the visual approach to runway 05 seemed normal until the point Rosario, when he began to notice effects of "wind shear" and coincident with the automatic altitude call of 50 feet, the aircraft developed a high sink rate. The PF continued with the approach and he attempted to arrest the rate of descent but the aircraft landed heavily and bounced to a height of about 8 feet and continued for about 300 meters. During the second contact with the runway, the tail of the aircraft struck its surface at a speed of about 140 kts. The PF was able to control the aircraft safely within the confines of the runway. A preliminary visual inspection showed some deformation of the outer surface of the fuselage and significant skid marks on the underside of the rear fuselage. Closer inspection, performed by maintenance services, revealed the existence of a deformed drain tube, some bent struts with five cracks found on two fuselage frames that had suffered structural damage from the vertical loads sustained in the contact with the runway. The accident was due to an excessive nose up input after the first contact with the runway and at a time in which the aircraft was airborne at around 8 feet (RA) which, associated to the manual deployment of the speedbrakes and consequent loss of lift, resulted in a sharp nose up attitude (9.15°) to a point of causing the tail strike with the runway surface. To issue instructions to the flight crews to strictly adhere to the company SOP´s. Review the recency rules regarding B737- 800 variant pilots when operating at CAT C airports. To incorporate bounced landing recovery training among the B737-800 variant. To practice the speedbrakes manual deployment in a timely manner, e.g. by firstly identify the attitude and condition of the aircraft, in the event of an automatic deployment failure. Distance from Leeds/Bradford Airport to Funchal Airport as the crow flies is 2621 km (1638 miles).